With Apples in Season, I thought a little paper craft would be a fun way to celebrate. Also with back to school happening this time of year all things Apple are making me happy right now. 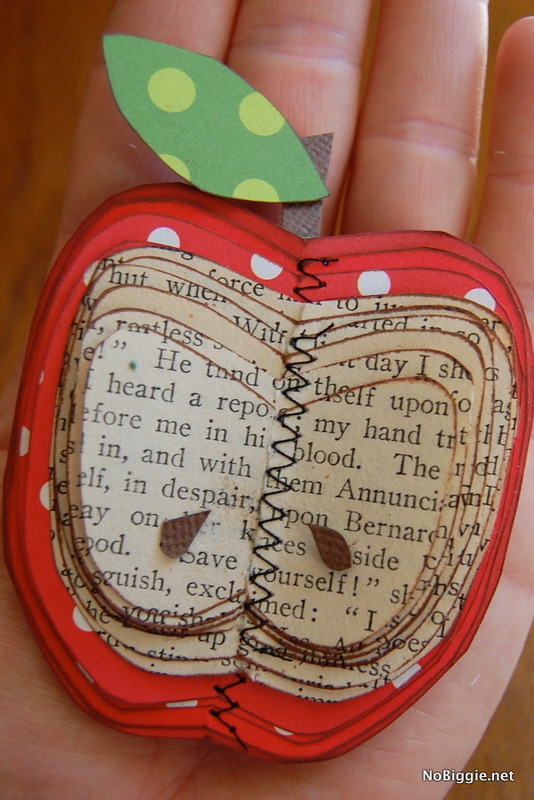 I love the combination of old vintage book paper and the layered look this 3D apple has together giving it great dimension. I used this old Jane Austen book. This is a fun paper craft that anyone could make, because you don’t need a bunch of tools. Although you do need a sewing machine (that’s a big one). You could also try hand stitching too if you don’t have a sewing machine. Step 1 – Tear out about 4 pages from an old book. Step 2 – The older the book the better. 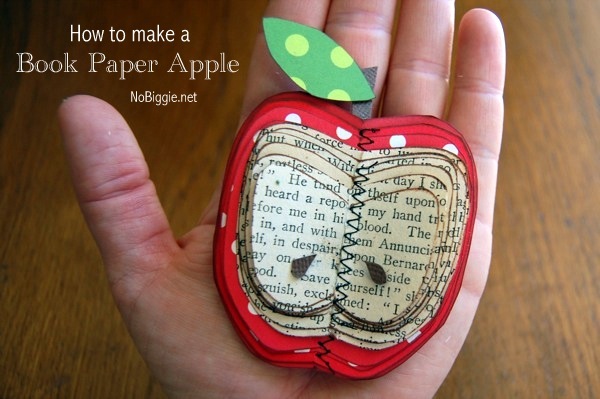 Step 3 – Fold one page of book paper in half and cut out a half of a small apple shape and then layer that shape back onto the page and repeat cutting a bigger size each time. Step 4 – Continue on with the layers 4-5 times. Step 5 – For each layer, just fold over the folded edge with all the layers cutting a bigger size each layer. Step 7 – Gather up a bunch of paper scraps in apple colors: bright red and green apple. Step 8. Fold in half a fun red paper and repeat cutting a bigger layer. Step 9 – Add as many layers as you’d like, I did about four layers in red. Step 10 – for a nice touch, ink the edges with a small brown ink pad. Step 11 – Sew together the book pages and the red papers separately both with zigzag stitch. Step 12 – Glue both the layers together and add in some apple seeds, a brown stem and a leaf. Step 13 – Make a second one with more appropriate words on the top layer. Step 14 – Put your little decoration in a shadow box for all to see! That’s it. Isn’t it cute?! This is a fun one to make. Okay, so cute it's tempting to try one over here! That is so cute (even with all the blood and despair)! I will never make that, because mine would look like a giant dodge ball, but it sure is adorable! I LOVE this. It's so dainty and cute. I want to eat it!! I've never seen anything like this little book….it's darling! I love this! I'll have to start checking thrift stores for really old books. super cute! love this! I want to make this for Xmas gifts for teachers! thx for sharing! I love this idea! This is very creative and a great way to recycle old books or I bet newspaper or old papers with typing would work too. Such a fun idea. Love this idea! Would love to do it with my Girl Scouts…but without having to sew. Anyone have an idea for a different method to attach the layers? Stack up all the layers, place them on either a piece of scrap wood or an old bread board and using a small nail tap the nail until it pierces all the layers of paper, then you could use heavy button thread and a large hand sewing needle and hand sew them together. Might even look cuter hand sewn! This is absolutely adorable and I laughed out loud when I saw your note to pay attention to the words on the page because as I was finishing a wreath today with rosettes made from dictionary pages I realized that my 'give thanks' wreath would be graced with not only the purposeful "thanksgiving" definition, but also "venereal" …. Oops! This is so cute!! I recently made some leaves from book pages and the words were so funny. They didn't fit like these do! i cant stand how cute this is! I love it!!!! Hi Kami, this is my first time on your blog, and I just love that apple! It would be so great if you would join a very nice group of international crafters at my weekly linking party, Craft Schooling Sunday. Always full of really inspiring projects! Hope to see you there and feel free to share a few of your best ideas, so we can get to know you! So pretty! I love the idea of stitching paper! Thank you for sharing! Lovely Project…I'll be featuring this post on my blog, ok? I hope you don´t mind. amazing! how talented! lol about making another one with more appropriate words. Brilliant – I think I might use the idea to make some colourful, easy ball balls for the Christmas tree. Great tutorial, I can't wait to find some old books and try it! Stop by sometime, I have a few Giveaways going right now. I would love it if you linked to my Party!!! Loving this!ooooh and the possibilities are endless. I'm thinking Christmas stuff. Love it! Thanks for the tute. That is so cute! I am thinking these would make cute teacher gifts. Maybe make a Christmas ornament. I came over from Life as Lori. This is an adorable idea! I'm your newest follower, I found you at Tip Junkie! You can find me at Sassy Sites- xoxo!! I'll have to try this. Love the idea that it's from a book. Your apple is so cute. I love that you caught the words on the page – that was cool! Love this! Come plant your creative seeds at my linking party on Fridays: Plant a Punkin Seed at Punkin Seed Productions. ok. you're invited: come link it up with us: http://www.finecraftguild.com/diy-linky-party-21/ and you may find some great other ideas there also. looking forward to showing off your work to our readers. This is truly cute, I love the textures the book pages make. And the darkness, blood, and despair are a nice too, too! Cute blog! I'll back for more inspiration. I love how clean and well-edited the blog and blog design are! wow, what a cute project! I love it!!! I might have to try this! adorable! You could do so many different things with that technique! thanks for sharing! Cute! I wonder why you'd sew through the two stacks and then glue together, rather than sew through the whole stack? Is it too much to sew through that many layers? Love it!!! Too cute… and those words, oh MY! That cracked me up!! Very ingenious! Thanks for sharing! I made mine slightly different.I used 2 pieces of felt for the back of the apple and made it a ornament for my child's teacher.Thank you for the inspiration. don't feel bad about blood, dispair and save yourself. my friend has a wall hanging from hobby lobby with a flower panted over a book page background, the book page is from a spiderman novel. the words spidey and dr. octopus are clear and obvious. This is SO cute 🙂 Please come on over and link up to MMM!! GOsh that’s cute! Thank for sharing this. This is SO precious. What a gorgeous gift it’d make!